The trip started out great! All four flight connections were on time and my bags arrived when I did. I am traveling with a healing broken ankle and have to wear a ortho boot. The wheelchair assistance in the airports were awesome. I landed in Tahiti at 5 am on Thursday. It was still dark so I didn’t see much when we landed. When the sun rose it was amazing – so beautiful and smelled so good. Checked into my room at about noon. I loved it. It had a Jacuzzi tub with view of ocean, a nice balcony and a really comfortable bed. After a nap I checked out the beach. Beach was not my favorite… black sand and no loungers at all. The sand was also really hot. The Infinity pool was great though. Day one we met with our Contiki group at the hotel in Bangkok. The group consists of 31 people, which is actually oversold, so we jumped right into orientation. Our tour manager’s name is Soki, and he is from New Zealand. He gave us the rundown of how the week will work, and we finalized some paperwork. To help us get to know each other better we headed down to Khao San Road (popular for restaurants, bars and shopping) for a group dinner at one of his favorite Thai restaurants, My Darling. The food was excellent, and it was a great way to break the ice with the group. We had an early start for the next day, so we headed back to the hotel to pack up and get some sleep. Day two was a jam packed day. Right after breakfast we headed to the Royal Palace with our local guide. 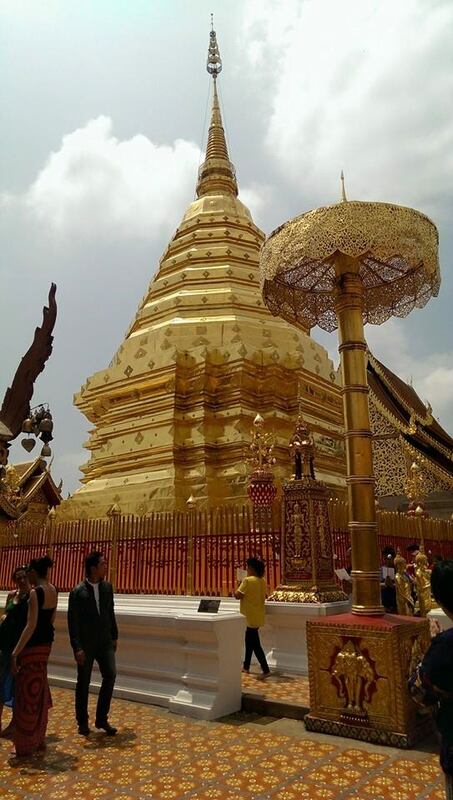 Since it’s a temple and palace, proper attire is required – pants or floor length skirt and covered shoulders – which makes for a hot, sweaty day. The palace is beautiful. Every thing is so old and ornate. Our tour lasted around 2 hours, and then we headed to the river for a boat tour and catfish feeding. There was about 2 hours left for free time when finished, which gave us enough time for lunch before we had to get ready to head to the train station for the overnight train to Chiang Mai. The train ride was about 14 hours, and we had sleeping berths for the night. You can buy a meal, or bring your own. It’s a comfortable enough journey, and by morning we were at our next stop. Day three we woke up just outside Chiang Mai. Another busy day was ahead of us, starting with a quick stop at the hotel for breakfast. 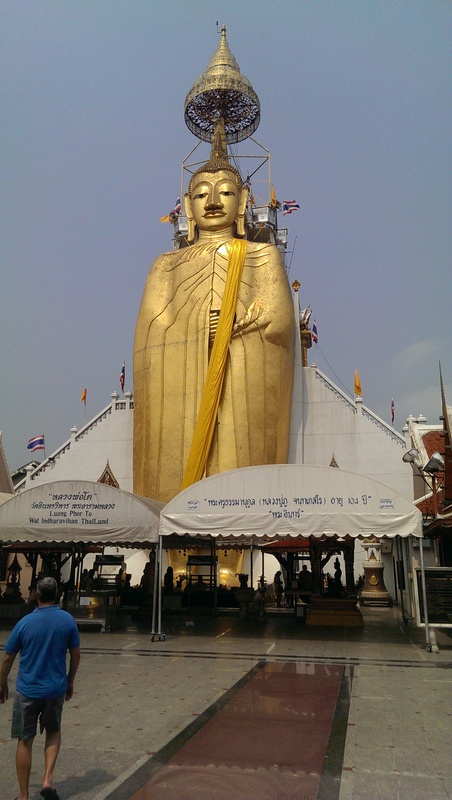 Our rooms weren’t ready, so we headed right to Wat Phra That temple, which is on the mountain side overlooking the city. It’s such a spiritual culture here, and we all received a blessing by a monk. When finished, we have 3 hours for free time. A bunch of the group planned on heading to Tiger Kingdom to interact with tigers, so we decided to definitely tagging along. 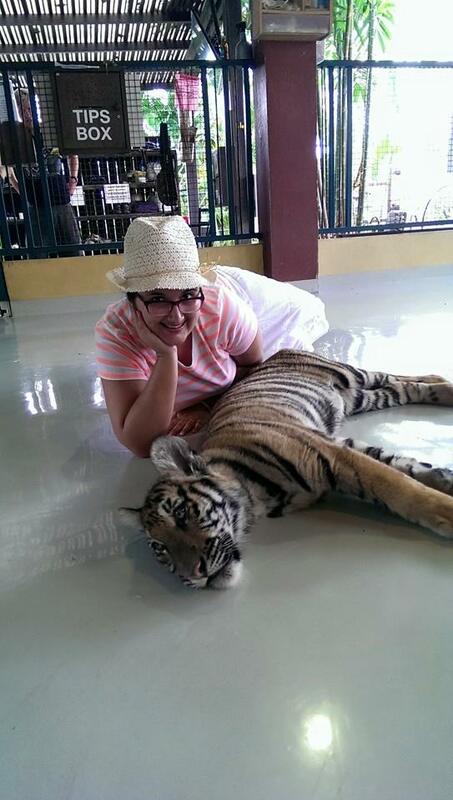 It was absolutely amazing to be so close to such a powerful animal! There was just enough time left to get back to the hotel to meet the group for the optional Thai cooking class ($30 USD pp). 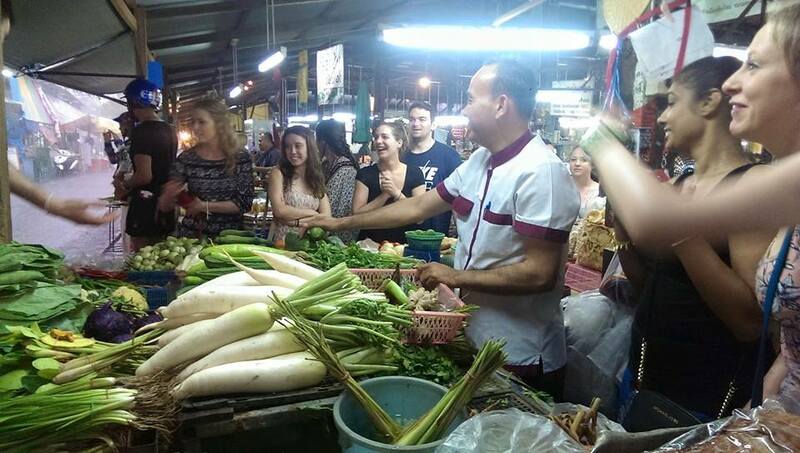 Its starts at the market with the chef, where he explains the different ingredients. Then we were off to the cooking center, which is in a rice field. We made tom yum soup, chicken with cashew, pad thai, and panang curry. It was such a great group bonding experience where we were able to laugh, joke, and really brought us together. The night ended with some of us heading to a traditional Muay Thai fight. It finished pretty late, and was after midnight before we get to the hotel. I can’t believe we’ve packed so many activities already, and how much more is left. I’m looking forward to the rest of the tour, and sharing it all with you! What a change from simple, quiet Saskatoon – After 3 flights, many airline meals, and 30 long hours, my husband and I have finally made it to Bangkok. By time we made it to our hotel, our brains were pretty fried but the journey was well worth it. We’re now in an amazing city full of color and culture. Our first night spent at Nuovo City Hotel Bangkok didn’t consist of much more than a shower and sleep, but now that we are well rested the adventure begins. The morning starts with us heading out in whatever direction our hearts take us. We end up on a street corner talking to a friendly Thai gentleman (everyone is very friendly I might add) who helps us get a tuk-tuk to get around. 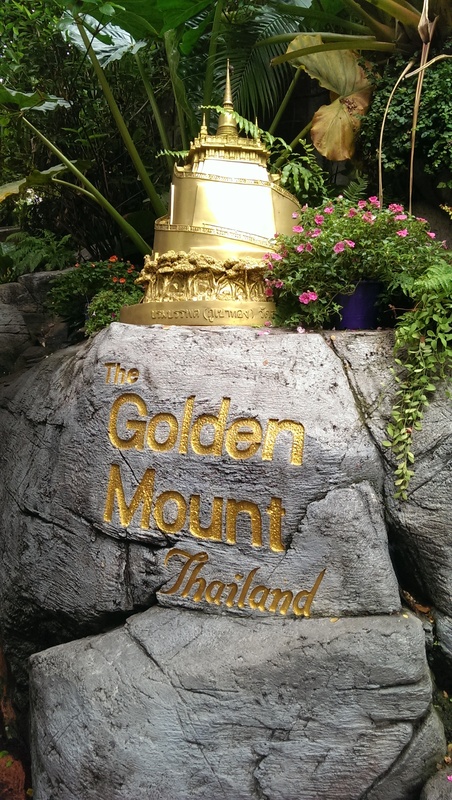 For only 40 Baht we are driven around the city to various temples, a custom suit store, and Golden Mountain, which is a beautiful temple where you can get great views of the city. 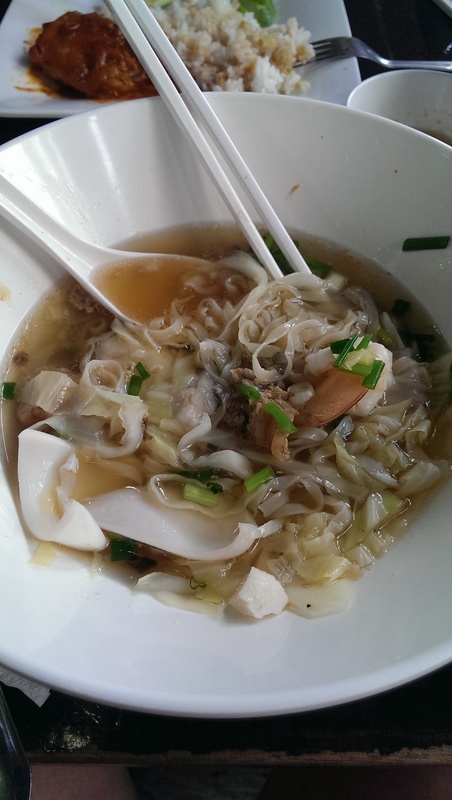 For lunch we stop at Patong Go, a cute little cafe, and both of us eat for only 144 Baht, which is just over $6 CAD. After lunch, the heat is starting to get to us so we head back to the hotel for some air conditioning and a dip in the pool. Tonight we will meet up with our Contiki group to start an amazing Asian Adventure.